At the time this article was written, there were over 2,000 jobs posted on jobsearch.gov.au for window cleaners. If you love working outdoors, then you might want to consider this field. In June of 2014, the minimum wage was raised, and there are loads of companies out there that pay considerably more if you are hard-working and skilled. Certification differs based on location, so check with your local regulatory agency to find out what qualifications are needed. 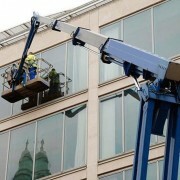 Most window cleaning jobs are for large buildings; this is known as commercial cleaning. Many modern buildings have been constructed with window maintenance in mind, and therefore have balconies or permanent high rise work surfaces that give you access to the windows. However, most of the time you will be relying on high rise rigging or suspended scaffolding. Residential window cleaning jobs have a different set of challenges. Instead of worrying about access—most windows can be reached with regular ladders—you have to be mindful not to damage gardens or carpet. Many residential windows are best reached via the interior of the home, and measures should be taken to prevent any damage to flooring. There are different safety regulations for working at height on industrial sites, private homes and businesses, and working in a densely populated area. Nearly all companies require their window cleaning technicians to go through extensive training so they can comply with these safety requirements, ensuring the safety of workers and the general public. To read a bit more about working safely with access equipment, check out our article on preventing falls. As a window cleaner, you’ll have to assess the glass at each job in order to properly select the right cleaning tools, techniques, and products. Many churches and historical buildings have extremely delicate glass, and special care must be taken when cleaning it. Likewise, other building materials, such as loose shingles, will factor into how you approach the job. You’ll also have to see if you are doing a standard cleaning, or if you’ll be working to remove paint or other industrial products that may have accidentally ended up on the glass. Attention to detail and being able to assess a variety of situations is important. There are times you need to be minimally disruptive, like when working at schools or hospitals. For sensitive sites and mid-rise buildings, a boom lift is often your best bet for getting in and out quickly and safely. Boom lifts provide great manoeuvrability, and Force access equipment hire has varieties for all kinds of jobs. For example, if you are working in an urban area and need access equipment that doesn’t block the road below, Knuckle booms are great. They enable you to access heights while keeping passers-by on the ground safe. Window cleaning is a great job for those who enjoy working at height, and it’s one of many where access equipment is often a necessity.